FILE: In this image made from video, Major Gen. S.B. Moyo, Spokesperson for the Zimbabwe Defense Forces addresses to the nation in Harare, Zimbabwe, Nov. 15, 2017. President Emmerson Mnangagwa on Thursday evening announced a 22-member cabinet comprising two senior Zimbabwe Defence Forces members, who played a critical role in catapulting him to power a week ago. In a statement, signed by one R. Chikowore and said to have been dispatched by cabinet secretary Misheck Sibanda, the list of “new” ministers excluded all Zanu PF members that were affiliated to former First Lady Grace Mugabe’s Generation 40 faction of the ruling party. In a move widely seen by political observers as an attempt to reward the military and war veterans for removing former president Robert Mugabe from power, Mnangagwa appointed Major General Sibusiso Moyo as Minister of Foreign Affairs and Air Marshal Perrence Shiri to the critical position of lands, agriculture and rural development. 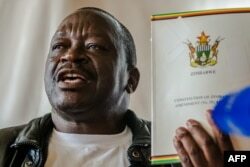 FILE: Zimbabwe National Liberation War Veterans Association (ZNLWVA) Secretary-general Victor Matemadanda holds up the country's constitution at a press conference in Harare on November 15, 2017. He also appointed outspoken war veterans leaders Christopher Mutsvangwa (Minister of Information) and Victor Matemadanda (Deputy Minister of War Veterans). Mnangagwa retained most of the ministers who were in the former president’s cabinet save for those aligned to Generation 40. Several people that were once dumped by Mr. Mugabe, including Angelina Masuku, July Moyo, Monica Mutsvangwa, Ndabazekhaya Ginyilitshe Cain Mathema, Ziyambi Ziyambi and Abednico Ncube bounced back into ministerial and deputy ministerial positions. Fresh cabinet ministers and deputies include Professor Amon Murwira (Minister of Higher Education, Science and Technology), Professor Clever Nyathi (Minister of Labour and Social Welfare), Winston Chitando (Minister of Mines) and Owen Ncube (Minister of State for Midlands). The old guards include Patrick Chinamasa (Finance), Obert Mpofu (Home Affairs), Lazarus Dokora (Education), Kembo Mohadi (Defence), Sithembiso Nyoni (Local Government), Oppah Muchinguri-Kashiri (Environment, Water and Climate), Simbarashe Mumbengegwi (State for Presidential Affairs and Monitoring Government Programs), Josiah Hungwe (State for Masvingo) and Super Mandiwanzira (ICT and Cyber Security). 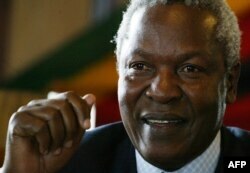 FILE - Zimbabwe's Defense Minister Sydney Sekeramayi is pictured at a press conference in Harare, May 22, 2008. Conspicuous by his absence in the cabinet are former State Security Minister Sydney Sekeramai and former War Veterans Minister Tshinga Dube. Some observers have criticized the so-called new cabinet saying Mnangagwa has let down Zimbabweans, who expected him to drop most of the ministers who have served in various portfolios since independence from British rule in 1980 in favour of fresh faces. Dr. Christopher Mushohwe, as Minister of State for Government Scholarships in the President’s Office.